The Ogiek, one of the last forest-dwelling hunter-gatherer communities, are among some of the most marginalized of all indigenous peoples and minorities in Kenya. 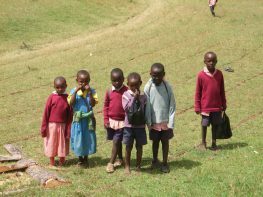 Since time immemorial, they have lived in the Mau Forest in Kenya’s Rift Valley and in the forested areas around Mt Elgon, relying on these territories for food, shelter, identity and therefore their very survival. Since independence, and indeed prior to it, the Ogiek have been routinely subjected to arbitrary forced evictions from their ancestral land by their Government, without consultation or compensation. This has had a detrimental impact on the Ogiek’s pursuit of their traditional lifestyle, religious and cultural life, and access to natural resources on their land and, more generally, access to education, health services and justice. In 2009, a case was lodged by OPDP and CEMIRIDE, on behalf of the Ogiek, before the African Commission on Human and Peoples’ Rights (the ‘African Commission’) against the Government of Kenya. The case alleges violations of the Ogiek’s rights to life, property, natural resources, development, religion, culture and non-discrimination under the African Charter on Human and Peoples’ Rights. MRG became involved in the case in April 2010 and, after an extensive fact finding mission and community consultations, drafted and filed admissibility submissions before the African Commission in August 2010. In 2012, the African Commission decided to refer the case to the African Court on Human and Peoples’ Rights (the ‘African Court’) as it demonstrated serious and mass human rights violations. On 15 March 2013, the African Court issued a provisional measures order, requiring the Kenyan Government to (i) immediately reinstate the restrictions it had imposed on land transactions in the Mau Forest Complex, and (ii) refrain from any act/thing that would/might irreparably prejudice the main application, until the African Court gives its final decision in the case. The order was issued as the African Court considered that ‘there is a situation of extreme gravity and urgency, as well as a risk of irreparable harm to the [rights of the] Ogiek of the Mau Forest’. On 27 and 28 November 2014, the African Court heard arguments from the African Commission legal team as well as two Ogiek witnesses, an expert witness, and an intervention by MRG on behalf of the original Complainants. MRG also supported 25 Ogiek to attend the hearing in person and supported a further 40 Ogiek to view the hearing live in Kenya via the live stream link. Despite the case, there have been continuing violations of the provisional measures order, with a violent eviction of approximately 1,000 Ogiek and police intimidation. In May 2017, the Committee on the Elimination of All Forms of Racial Discrimination noted its concern in response to reports of ongoing forced evictions that were brought to the Committee’s attention. The Kenyan Government has also announced its plans for the Mau Forest Complex, which will soon become government land and its inhabitants relocated. MRG issued a firm statement at the March 2016 session of the United Nations Human Rights Council on this. On 26 May 2017, the African Court of Human and People’s Rights delivered its landmark judgment in the case. The African Court found the Kenyan Government had violated seven separate articles of the African Charter on Human and People’s Rights, with the violations amounting to a persistent denial of Ogiek land rights and their religious and cultural and hunter-gather practices. This is one of the African Court’s first ever cases and the first decision to consider the rights of indigenous peoples. The ruling is significant for the Ogiek but the judgment also sends a clear message that African governments must respect indigenous peoples’ land rights in order to secure their livelihoods and culture. This is also one of the first cases brought originally by NGOs to have been referred to the African Court by the African Commission, and the first ever in which judgment was issued following a hearing on admissibility and the merits, and therefore has created both important procedural as well as legal precedent. MRG also continues to work with the Ogiek community to identify a common set of conservation standards by which they can request the land to be returned to them, undertake a community mapping of Ogiek land, pursue international and national advocacy work (including a shadow report to Kenya’s Universal Periodic Review before the Human Rights Council in 2016) and provide capacity building training to the community through paralegal training.